Sitka’s municipal election saw high voter turnout and definitive outcomes for two ballot propositions. The senior sales tax will be reinstated and Sitka bars will not be exempt from a statewide smoking ban. Gary Paxton (1372 votes, profile), a former city administrator, is now the mayor-elect. 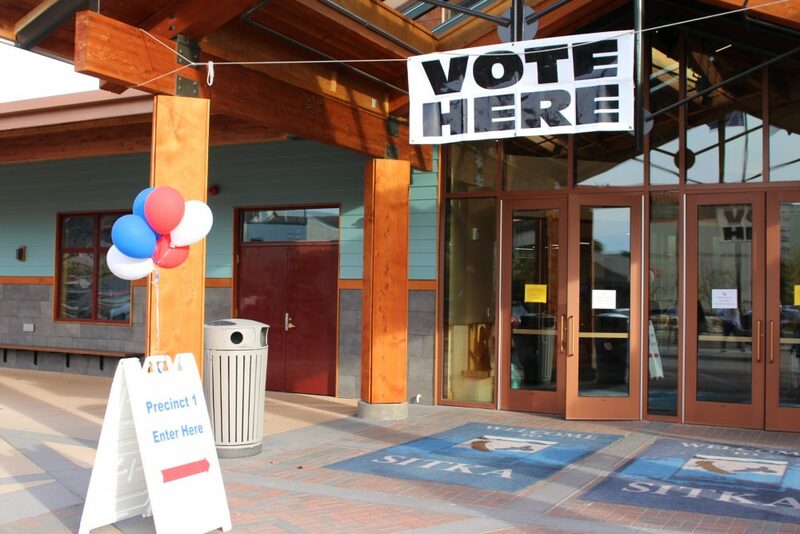 Candidates with the highest votes include Kevin Mosher ( 1029 votes, profile) and Valorie Nelson (906 votes, profile) for the two open seats on the Sitka Assembly and Eric Van Cise (1546 votes, profile) and Amy Morrison (1411 votes, profile) for two open seats on the Sitka School Board. If these results stand after city hall counts absentee ballots are counted on Friday, Ben Miyasato will step down from the Sitka Assembly and Cass Pook from the Sitka School board. Tuesday night’s municipal election saw the highest voter turnout since 2010, with 2424 votes cast between precincts 1 and 2. The city also issued 550 absentee/advanced voting ballots and has received 532 in the mail so far. They will count those ballots and question ballots tomorrow, October 5th, at 3 p.m. at city hall. Voters approved reinstating the senior sales tax exemption by a 3 to 2 margin. Shirley Robards gathered the necessary signatures to put this issue on the ballot. The night of the election, she told KCAW that she was very happy with the outcome. “The older people really paid their dues. I know that they think that there will be nothing but old people and we won’t be able to afford anything, but I don’t think that’s going to happen,” Robards said. Robards is referring to demographic data, which predicts that senior citizens will represent a greater portion of Sitka’s population in the coming decades. This outcome reverses the Assembly’s decision to replace the senior sales tax exemption with a low-income rebate program. Petersburg put a question on their October ballot, asking voters if they wanted to copy what Sitka did. According to KFSK, that measure failed by a 3 to 1 margin. October 1st has brought a new statewide smoking ban into effect, which prohibits smoking at bars and restaurants. State statute includes an opt-out provision. Sitka was also the only community in Alaska to take advantage of that. While staff at Ernie’s Old Time Saloon rallied – gathering the necessary signatures to put this question on the ballot – voters turned it down on election day. This means that establishments that once allowed smoking–Ernie’s, the Pioneer Bar, and American Legion Post 13–must now remove ashtrays and put up no-smoking signs. Smokers now have to take it outside, ten feet from the building. Roll-out of the law begins with a campaign to educate businesses on how to comply. During a KCAW call-in show last month, Emily Neno, Alaska Government Relations Director with the American Cancer Society, said that in her experience, clean air laws are self-enforcing. “People get used to them very quickly and simply step outside to smoke,” Nenon said. Nenon added that the smoking ban does not affect local nor state marijuana laws. The Marijuana Control Board is currently seeking comment for how to regulate marijuana cafes. Sitka elected a new mayor, 79-year-old Gary Paxton. He spent three decades in the U.S. Army and served as Sitka’s municipal administrator during the critical period when the Sitka pulp mill closed. Paxton said that once he gets the mayor’s gavel in his hand, his first priority was to “bring a sense of peace and work together to solve our problems.” He especially wants the city to negotiate with SEARHC in a way that the fosters community trust. “Have more open meetings perhaps, less executive sessions, so that we can stop some of the conspiracy theories which are always prominent in small towns. I want to do a good job and be kind to people,” Paxton. Negotiations between the city and SEARHC over Sitka Community Hospital will likely begin this month. Paxton will be sworn in on October 9th alongside two new Assembly members. With Kevin Mosher and Valorie Nelson earning the highest number of votes, they will claim those seats unless absentee/advanced voting ballots tip the scale. Assembly candidate Brinnen Carter trails behind Nelson by 46 votes. Sitka voters returned one school board member, and replaced another, during Tuesday’s municipal election. Incumbent Eric Van Cise was the leader in the three-way race, with 1,546 votes. Challenger Amy Morrison took the second seat, with 1,411 votes. Incumbent Cass Pook came in a strong third with 1,127 votes, but with only two seats open she’ll be taking her leave after 17 years of service on the Sitka School Board. Van Cise says it’s easier coming to a second term with the experience of his first term under his belt — but the district has been under financial pressure, and the board laid off teaching staff for the first time in recent memory last year. He wants guidance from the public in shaping next year’s budget. Amy Morrison campaigned on her over twenty years of business experience in Sitka. She doesn’t have any illusions about what it takes to oversee the community’s public schools. “I’m ready to hit the ground running. I realize that there’s a lot I need to learn about everything that goes into the schools. I’m excited to jump in and start learning and get involved,” Morrison said. Both Van Cise and Morrison have won three-year terms on the board. Morrison will be sworn in a special meeting at 6 p.m. Monday, October 15, after the Sitka assembly certifies the election results at its next regular meeting on October 9th.